Designed experiments based on a simplex mixture design were employed to explore the effects of three solvent components (water, formic acid, and aqueous acetic acid), extraction time, and extraction temperature for the automated microextraction of basic (cationic) dyes from acrylic fibers. Extractions were conducted by an automated liquid handling system, and dye extraction was evaluated using a UV/visible microplate reader. Highest extraction efficiency for two subclasses of basic dyes (methine and azo) from acrylic fibers was achieved with an extraction solvent containing 88% formic acid/12% water. Cationic dyes were analyzed by capillary electrophoresis using a 45 mM ammonium acetate buffer in acetonitrile–water at pH 4.7. 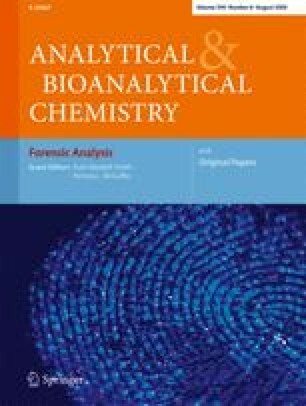 The utility of microextraction combined with capillary electrophoresis–mass spectrometry for analysis of extracts from trace fibers was demonstrated by the detection and characterization of three basic dyes extracted from a 2-mm length of single acrylic fiber. This research was supported under a contract award from the Counterterrorism and Forensic Science Research unit of the Federal Bureau of Investigation’s Laboratory Division. Points of view in this document are those of the authors and do not necessarily represent the official position of the Federal Bureau of Investigation. Portions of this work were presented at the FBI Trace Evidence Symposium (Clearwater, FL, USA) in August 2007.